Carlo Cottarelli, a former IMF economist, has been asked to form a technocrat government. Economist Carlo Cottarelli is surrounded by reporters as he arrives at Rome's Termini train station yesterday. ITALY’S CARETAKER PRIME minister is assembling a cabinet lineup despite almost certain rejection by populist parties whose bid for power collapsed at the weekend. Fresh elections are now looming as the most likely outcome of the long-running political saga sparked by an inconclusive poll in March. Carlo Cottarelli, a former IMF economist known as ‘Mr Scissors’, was tasked with naming a technocrat government yesterday after President Sergio Mattarella blocked a cabinet proposed by the far-right League and anti-establishment Five Star Movement (M5S). The president vetoed their pick for economy minister, fierce eurosceptic Paolo Savona, throwing the eurozone’s third largest economy into a fresh crisis. Savona has called the euro a “German cage” and said that Italy needs a plan to leave the single currency “if necessary”. Mattarella said that an openly eurosceptic economy minister was counter to the parties’ joint promise to simply “change Europe for the better from an Italian point of view”. Cottarelli said Italy would face new elections “after August” if parliament did not endorse his team, a near certainty given that Five Star and the League together hold a majority. The parties’ approved nominee for prime minister, lawyer and political novice Giuseppe Conte, stepped aside following the decision to reject Savona, crashing the proposed government after nearly three months of convoluted horse-trading. 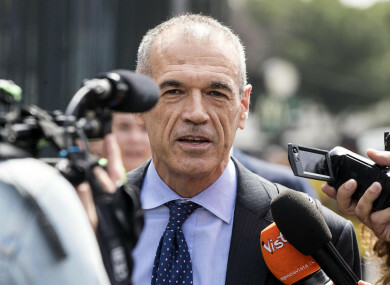 Mattarella’s veto and subsequent nomination of Cottarelli as caretaker prime minister sparked angry calls for his impeachment, since most lawmakers backed Savona. League leader Matteo Salvini, a fellow eurosceptic who was Savona’s biggest advocate, said the anti-establishment government failed because of pressure from the “powers-that-be, the markets, Berlin and Paris”. “This isn’t democracy, this isn’t respect for the popular vote. It’s the latest slap in the face,” Salvini said, from those that say “Italy should be a slave, scared and precarious”. Five Star chief Luigi Di Maio called on party supporters to attend a rally in Rome on Saturday, the anniversary of Italy’s transformation into a republic in 1946, after what he called “Italian democracy’s darkest night”. The latest chapter in the drawn-out political saga sent Italian stocks tumbling more than two percent yesterday and bond yields surging, with Italy’s debt risk premium hitting its highest level since November 2013. The euro also fell in Asian trade today and was in danger of falling below the $1.16 level last breached in early November. Cottarelli, 64, was director of the International Monetary Fund’s fiscal affairs department from 2008 to 2013 and became known as Mr Scissors for his public spending cuts in Italy. He said that should his technocrat government win parliamentary approval, it would stay in place until elections at the “start of 2019″. But if parliament fails to approve his government, a new election would be held “after August” – the most likely outcome given the populists’ strength in parliament. Only the centre-left Democratic Party has announced that it would vote in favour. Salvini and Di Maio furiously denounced the presidential veto, blasting what they called meddling by Germany, debt ratings agencies, financial lobbies and even lies from Mattarella’s staff. “Paolo Savona would not have taken us out of the euro. It’s a lie invented by Mattarella’s advisors,” Di Maio said in a live video on Facebook. The truth is that they don’t want us in government. Elections could benefit Salvini, however, as recent polling by IndexResearch put the League at 22%, five points up from its vote share in the March 4 ballot. Under the Italian constitution, the president nominates both the prime minister and, following proposals from the premier, the cabinet. The most famous example of a president denying a PM’s choice was in 1994 when Eugenio Scalfari refused then prime minister Silvio Berlusconi’s choice of his own lawyer – Cesare Previti – as justice minister. However, Di Maio said that Mattarella, a former constitutional court judge, had “gone beyond his legal prerogatives”. He said an impeachment trial for Mattarella, 76, would be “almost a certainty”. Most analysts however say such calls have little chance of success as impeachment is only possible in cases of “high treason” or constitutional breaches. “President Mattarella has only exercised his constitutional powers”, said Massimo Luciani, president of the Italian Constitutionalists Association. Email “Italy in crisis: 'Mr Scissors' picks his caretaker cabinet as fresh elections loom ”. Feedback on “Italy in crisis: 'Mr Scissors' picks his caretaker cabinet as fresh elections loom ”.